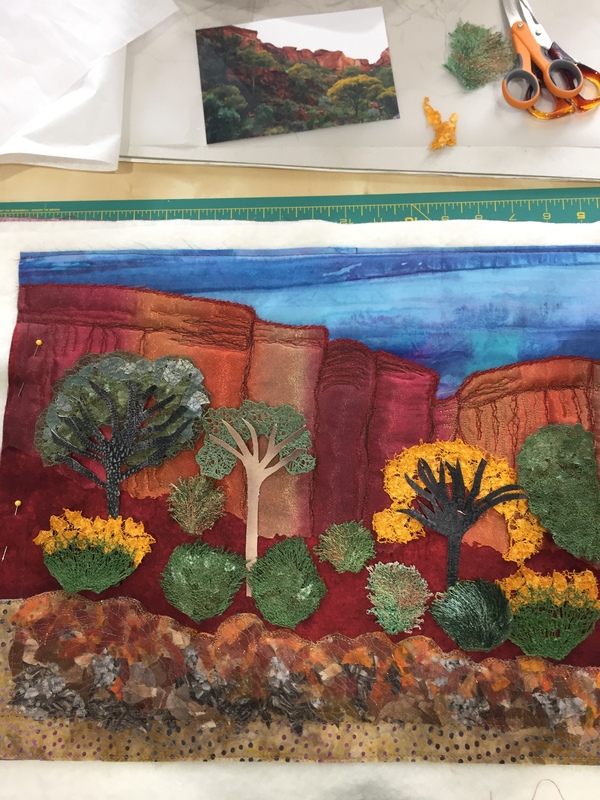 I’m working on a new textile inspired by a visit to the Red Center in 2010, it’s a view of Kings Canyon looking up at it and also the beautiful flora and rocks down in the Canyon. I did a painted sketch first and then sorted fabrics for the background and measured and cut them. I then made the section which will be the rocks at the bottom of the work, using cut up small pieces of fabric with sheer fabric and soluble fabric over that and then I stitched all over this. I also dissolved it in warm water and hung it to dry. Next step was to start on the greenery using soluble vilene I made the tree leaves using some cut fabric scraps and organza and soluble fabric, I also did this for the yellow tree. The gum tree is made on soluble with only thread painting. The grass plants are mainly thread painting on soluble some I used fabric scraps cut up small and some I added organza. The tree trunks are cut from cotton fabric ironed onto vliesofix. 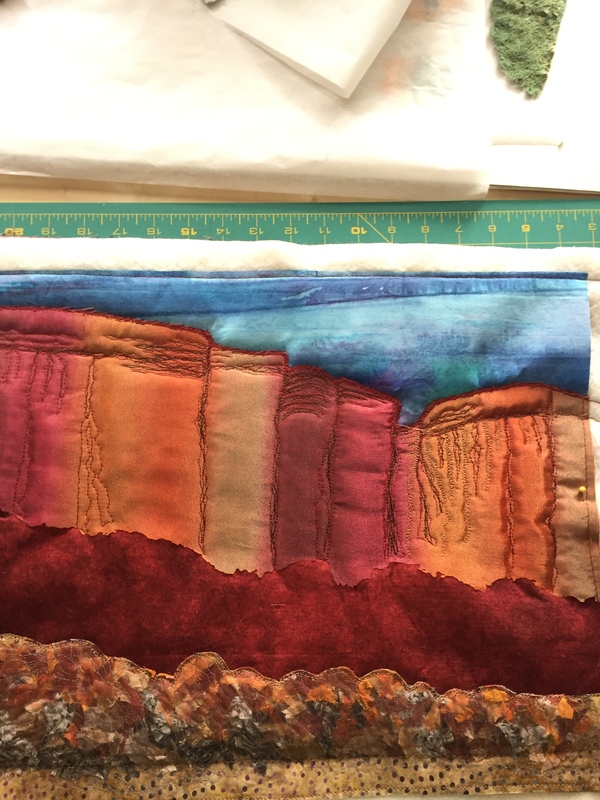 I have stitched the three sections together and quiilted the sky and did the free stitching on the high rock wall. I have a sewing machine hiccup so have to wait for that to be fixed next week before I can continue creating the flora section and then the small rocks in the foreground. I can’t believe I’m on the web! Thanks to my son Matthew. I would love to share my textile artwork/creative embroidery and inspiration with you, I also teach and am available for classes or workshops. This is all new and strange to me so it might take me some time to get set up with photos and information about my work. Look forward to sharing with you!